Canada has carried out its first air strikes in Syria, as part of the US-led coalition fighting Islamic State militants. Two Canadian CF-18s successfully targeted an Islamic State (IS) garrison near Raqqa, Syria, the military said in a statement. In March the Canadian parliament agreed to expand the country's campaign against IS into Syria. 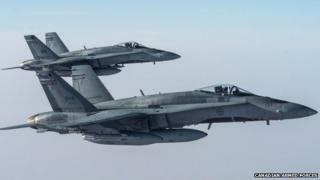 Canadian air strikes against IS were previously limited to Iraq. Canada is the first Nato country, other than the US, to strike inside Syria. Canada's mission against IS has also been extended for one year, beyond October's election and well into 2016. IS controls land on both sides of the Iraq-Syria border. The US expanded its air strike campaign against the militant group into Syria in September. Bahrain, Saudi Arabia, Jordan and the United Arab Emirates have also carried out similar strikes.